A Summer Choral Showcase this Saturday will raise much-needed funds for local charity COPE Galway, and give a taste of the breadth of musical talent in the city. Galway Choral Association, directed by Norman Duffy, will present a summer concert featuring choral arrangements of popular songs, spirituals and folk-songs. Also performing are the Scoil Íde National School choir from Salthill, and the NUIG Chamber Ensemble who will play excerpts from Bach’s Orchestral Suite No 2 in Bm. We can look forward to a guest performance by Galway’s premier male voice a cappella group, too. 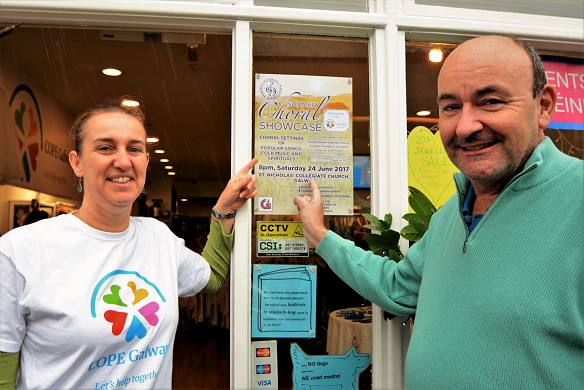 One of the choir’s aims is to create a spirit of enjoyment and camaraderie among choir members, and supporting groups like COPE Galway is an important part of this. COPE Galway is a local organisation providing support and services for people affected by homelessness, women and children experiencing domestic violence, and for older people, by supporting home, promoting community and reducing isolation. The concert is being held at 8pm on Saturday 24 June in St. Nicholas’ Collegiate Church, in Market Street. Tickets are €15 (€12 concession or €25 for the whole family) and are available from the Opus II in High St (091 500 300), COPE Galway’s shop in St Augustine Street (091 569 715), Scoil Íde, or from choir members. A limited number of tickets will also be available at the door, so that visitors to Galway don’t miss out.